We're going to need a cheaper Core m model, though, Microsoft. 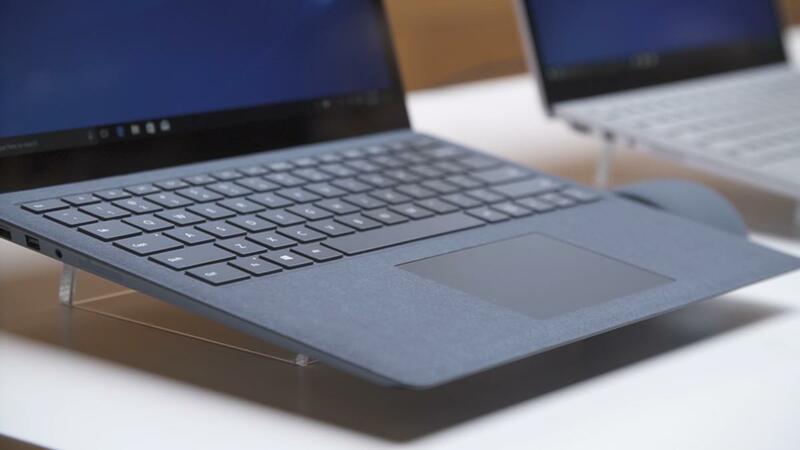 Two things will immediately strike you about the new Surface Laptop: It’s amazingly light and sturdy, and it borrows a lot of its look and feel from Surface Pro 4. Microsoft debuted two classes of devices for education at its event Tuesday morning: a number of third-party, rugged inexpensive clamshell devices for elementary and middle-school classrooms to compete with Chromebooks; and the Surface Laptop, designed for college students. We went hands-on with the latter after the event concluded. Think of the Surface Laptop as Microsoft’s answer to the MacBook Air: pricey, thin, and with battery life that goes on and on and on. It’s not a Chromebook competitor, but a far more premium experience. It does, however, run the new Windows 10 S: essentially Windows 10, but limited to apps from the Windows Store. Microsoft’s Surface Laptop, which will begin shipping June 15, starts at $999, and quickly goes up from there: the Core i5/4GB RAM/128GB SSD model is priced at $999, the Core i5/8GB RAM/256GB SSD is priced at $1,299, the Core i7/8GB RAM/256GB SSD is priced at $1,599, and the Intel Core i7/16GB RAM/512GB SSD is priced at a whopping $2,199. But those prices don’t include a Surface Pen, or an even more optional accessory, the Surface Dial. The Laptop seems to recline a bit further than the Surface Book. But note the stingy allotment of ports. Just open the Surface Laptop from a folded position (where it’s just 0.57 inches thick at its thickest point) to reveal the fantastic 4:3, 13.5-inch Surface display: At a resolution of 2256x1504, with 201 PPI, it looks absolutely gorgeous—but that’s what we expect of a Surface display, right? Below that display lies the keyboard, which looks like it was lifted from the Surface Pro 4, and then infused with some additional backbone. It’s both strong and sturdy, allowing you to grasp and support the entire device from the bottom, with just your fingers holding one edge. 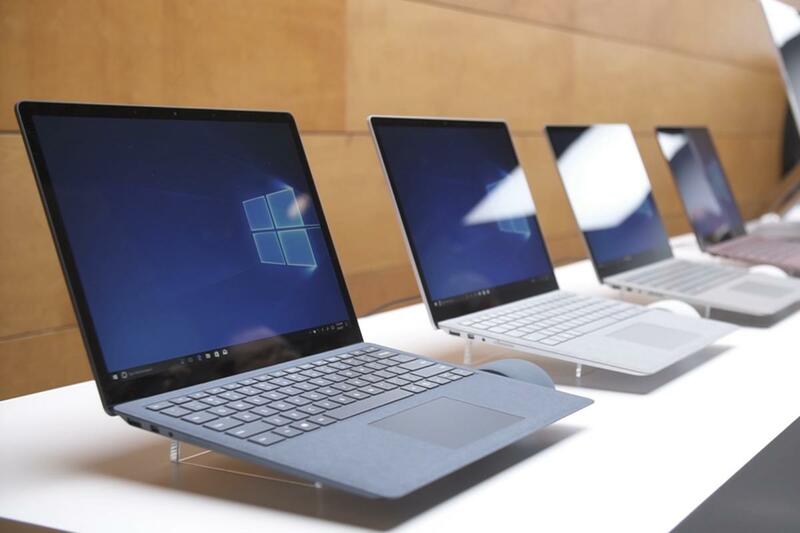 The Surface Laptop weighs 2.76 pounds, about a half pound more than a Surface Pro 4 and its associated Type Keyboard. It also appears to recline slightly farther than a Surface Book, which is a step up in my book. Both the keyboard and the trackpad feel like the ones on the Surface Pro 4. 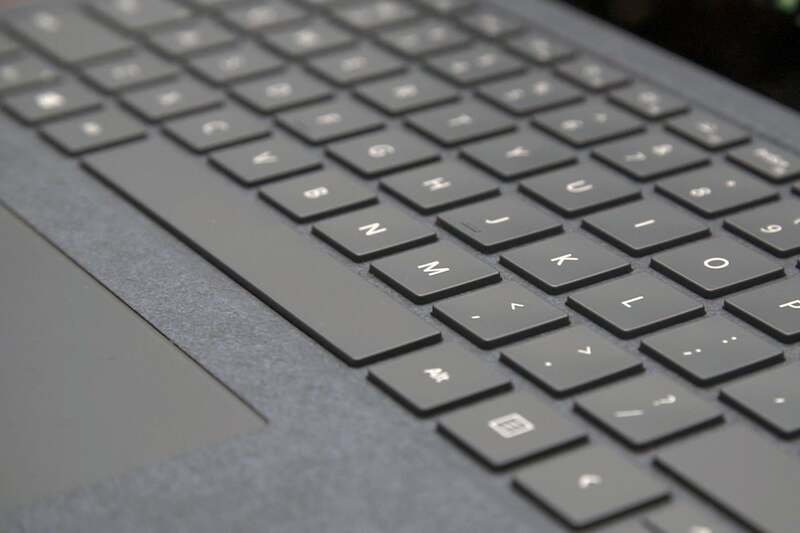 Microsoft said the keyboard’s key travel is about 1.5mm, consistent with the SP4. 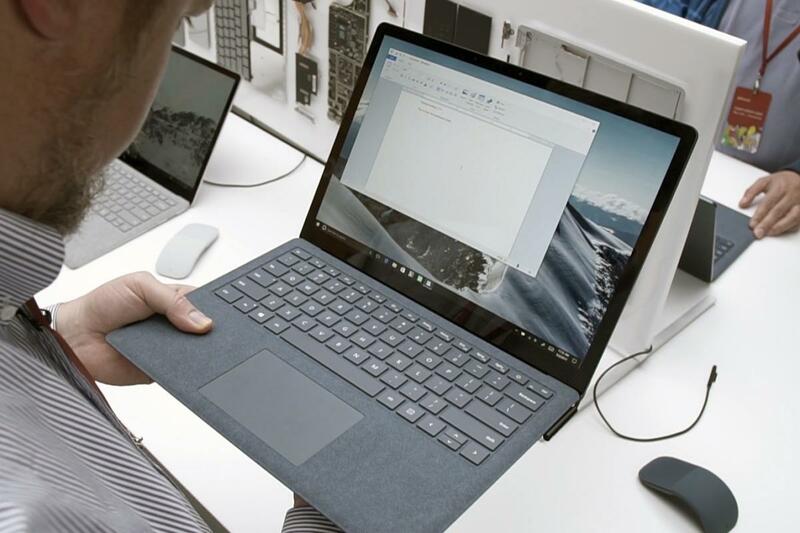 The laptop uses the same Alcantara fabric as the Surface Pro 4’s Signature Type Cover, and the keys are about the same size, too. 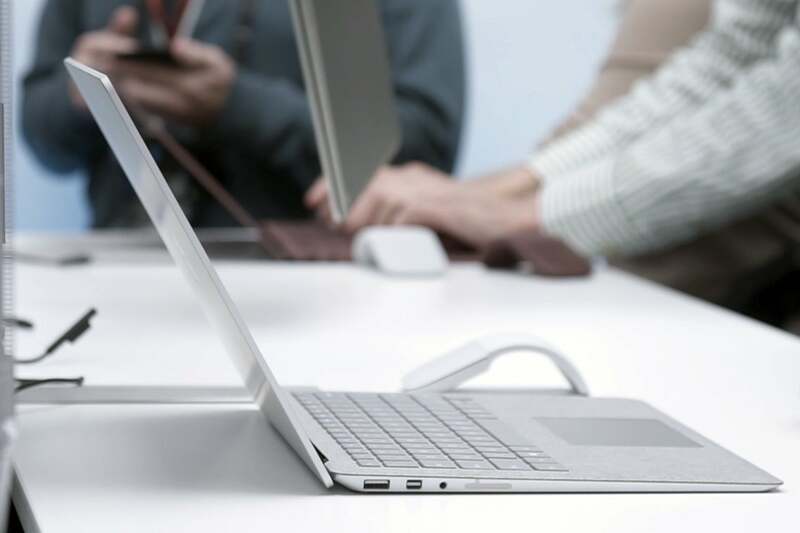 Like other Surfaces, the trackpad looks and feels fantastic. At the back of the keyboard resides a pair of Dolby Pro-quality speakers. Traditionally, the speakers hide behind the display. But by placing them behind the keyboard, Microsoft freed up additional room behind the display for batteries: enough to deliver 14.5 hours of video playback, according to Microsoft. That’s simply amazing. If there’s anything about the Surface Laptop that will give you pause, it’s the port selection. On the left side you’ll find the Surface connector, a mini DisplayPort port, and a single USB 3.0 connector—no SD card slot, no USB-C output. Microsoft engineers said they had to make some tough decisions about what to exclude, including both of those features. Of course, using the same Surface connector allows Microsoft to maintain charger compatibility. I’m not a huge fan of the Alcantara fabric, and it remains to be seen how significant an omission the USB-C connector is. For folks who have already bought into the Surface ecosystem, these issues are probably minor. So far, Microsoft hasn’t announced a cheaper Core m version of the Surface Laptop; I suspect that will arrive at some point to entice the student crowd who live off day-old pizza and beer, and not their parents’ credit card. Still, the Surface Laptop feels great in the hand, seems quick and responsive, and offers the Surface an important entry into the mainstream market.